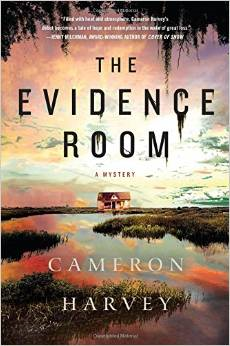 The Evidence Room is a debut police procedural mystery by my former student Cameron Harvey. Her prose is rich, evocative, and full of the nuances and subtexts we expect from someone who loves the written word and has the prodigious brainpower to raise language, image, and character above the mundane and into the realm of great fiction. The author is particularly bold in her characterizations, especially of the scratchy workaholic medical examiner who opens the book but also in the cherry supporting roles that linger in memory like a fine Bordeaux. Readers who anticipate being swept into a maze of unexpected twists and turns in pursuit of whodunit won’t be disappointed. Above all, setting is where the author deploys her paint box of metaphor and atmospherics, making the bayou a place where terror and the sublime coexist and where the artist’s brush plumbs the depths of our emotions. My prediction: If Ms. Harvey keeps on the way she has begun, she will end up in the ranks of the finest mystery writers of our time. Cameron graduated from Stanford University and UCLA Law School. She completed novel-writing coursework with me at UCI, was a long-time member of my Tuesday night critique group, and not that long ago, she won the Editor’s Choice Award at the San Diego State University Writer’s Conference. The awarding editor from Minotaur Books (a division of St. Martin’s), Kat Brzozowski, saw the book into print-and-release today in both hardcover and electronic editions. P.S., Ms. Brzozowski, the cover art is stunning! I wish Cameron phenomenal success with this book and many more. I’m exceedingly proud of her accomplishment.